I first saw it during a September 2010 cruise on Coniston Water. “What’s that?,” I asked our Mountain Goat guide. “That’s John Ruskin’s home, Brantwood,” he responded. There I was, sailing by the place where one of the Victorian era’s most influential people lived for 28 years, but I couldn’t stop to see it. I vowed to return one day, and I did, on October 10 of this year. John Ruskin was a gifted artist, writer, art critic and social reformer, an only child who spent much of his time alone, intensely pursuing his interests. He was also a controversial subject of public scrutiny after a sensational annulled marriage and an unsettling attachment to a girl almost 30 years his junior. Think what you will of him, but he created one spectacular home for himself in the Lake District. Ruskin started visiting the Lake District in 1824, when he was five years old, and more visits followed for the next 47 years. 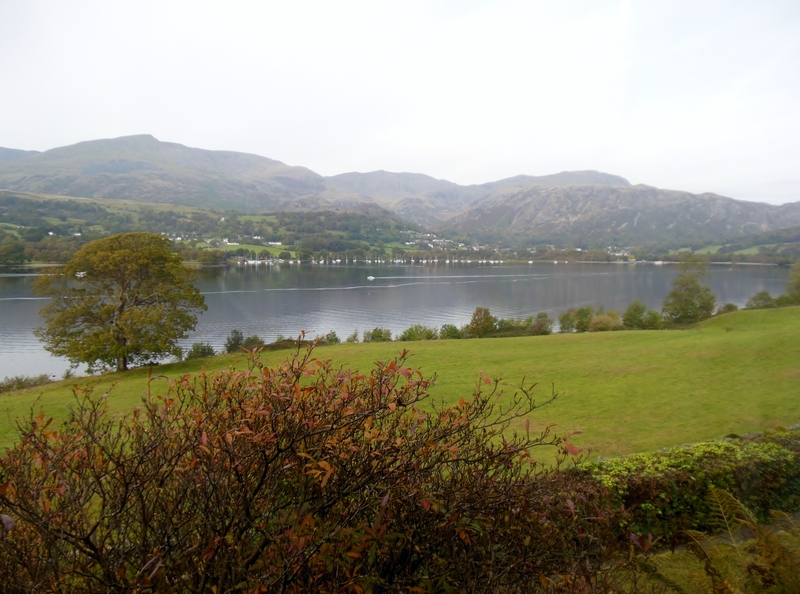 While rowing on Coniston Water during an 1837 holiday, he stopped in the harbor of a house called Brantwood to sketch the magnificent view that he saw across the lake. Brantwood was built around 1797 at one of those picturesque places that had been selected to provide the Lake District’s first tourists with the best views. In 1852, it became the home of W.J. Linton, an artist, writer and botanist who self-published two periodicals and wrote the first guide to Cumbrian ferns, The Ferns of the English Lake Country, in 1865. His wife was the popular Victorian novelist Elizabeth Lynn Linton, who wrote Lizzie Lorton of Greyrigg and Grasp Your Nettle while living at Brantwood. In 1871, 52-year-old Ruskin was at the height of his success, famous for writing books like Modern Painters and The Stones of Venice, but he needed some peace. 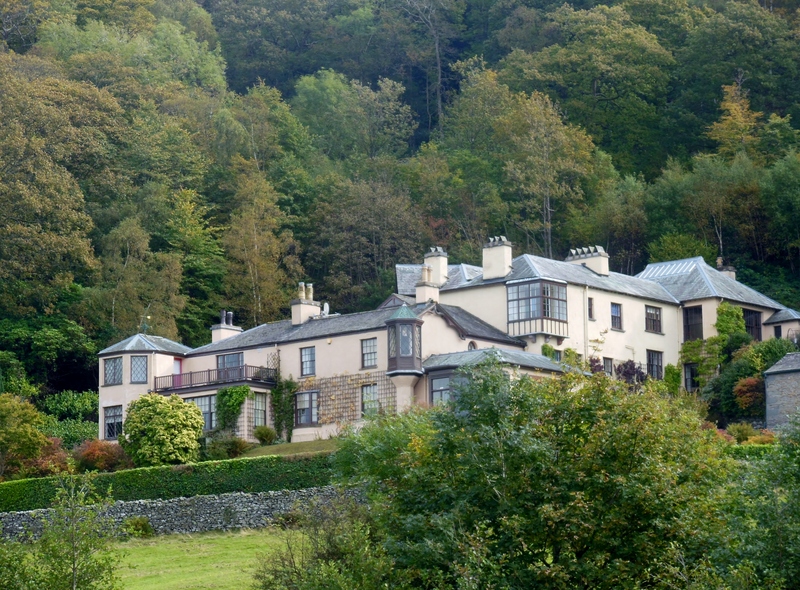 Linton wrote to Ruskin to ask him if he knew of any potential buyers for Brantwood. Ruskin didn’t recall the house, but he remembered its tranquil setting and stopping in its harbor to sketch. He replied that he’d buy the house for £1,500, sight unseen. When he moved to Brantwood in September 1872, Ruskin found that the house was a mess of rotten timber and loose stone, but the view was superb. “The scenery is — I think — the best in England,” he wrote to his friend Alfred William Hunt in 1873. Over the years, Ruskin made various improvements to Brantwood, expanding the house to 30 rooms and purchasing surrounding land to create a 500-acre estate. 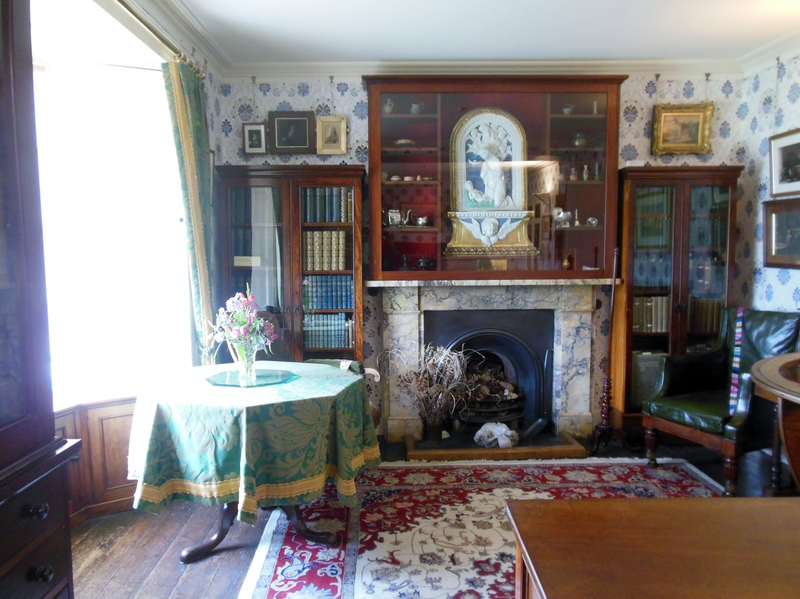 Today, visitors can take as much time as they like wandering through the house, which is filled with Ruskin’s paintings, furniture, decorative objects and personal memorabilia. The heart of Brantwood is the study. Surrounded by his most prized possessions, Ruskin wrote books, essays and volumes of correspondence at an octagonal table in front of a bay window with a beautiful view. He sat in his favorite chair, a collapsing campaign chair that he used during his travels. A cabinet contains his collection of shells, which he classified and catalogued on his own. Every morning at 10:00, Ruskin would head to the drawing room to eat strawberries and cream as he read. Here, you can see a fire-shovel, a shell bow and an upright piano, all of which he designed. The wallpaper is also his creation, based on a detail of a painting that he saw in the National Gallery in London. 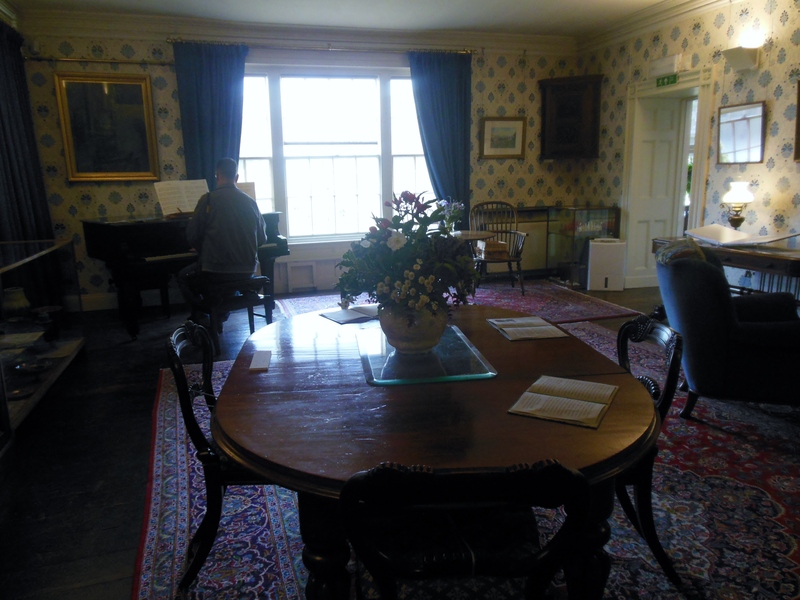 Since Ruskin used the room as a salon, visitors are encouraged to play a grand piano to recreate that atmosphere. 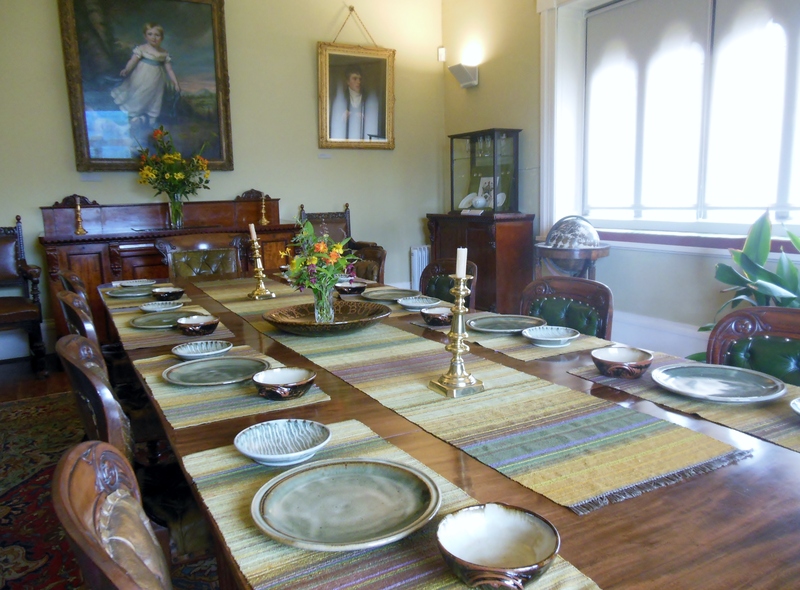 Faced with the prospect of having to find a place to put some of his parents’ furniture, Ruskin added a dining room, where an 1822 painting of him at three years old hangs in between portraits of his mother and father. 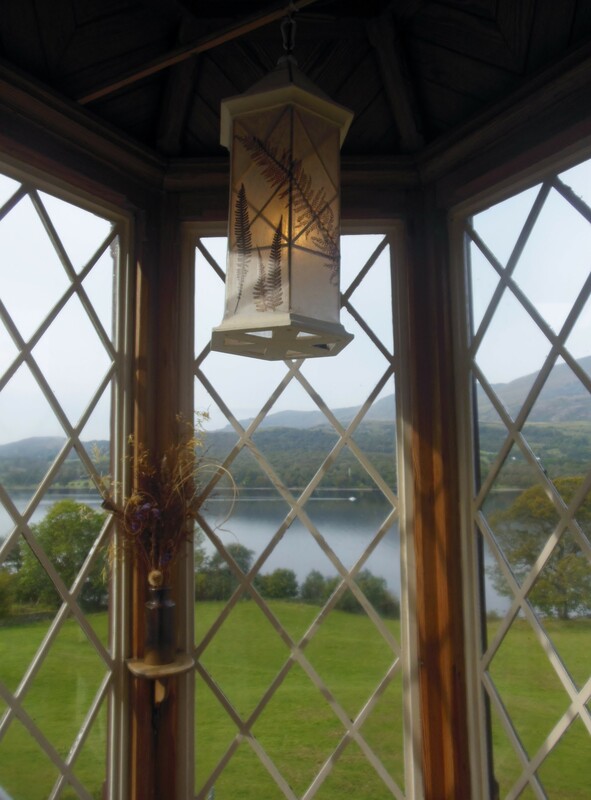 The star attraction of this room is a seven-lancet window with a magnificent view of Coniston Water and the fells beyond. The window represents the Seven Lamps of Architecture that Ruskin wrote about in The Stones of Venice. Needlepoint window seat cushions spell out those architectural principles for the visitor: Sacrifice; Truth; Power; Beauty; Life; Memory; and Obedience. Upstairs, Ruskin added a hexagonal turret to capitalize on his enjoyment of the view. This was connected to the room he used as his bedroom for his first six years here. Unsettling dreams caused him to sleep in another room, where he surrounded himself with 20 of his favorite watercolors by J.M.W. Turner. The house is filled with Ruskin’s paintings and sketches — architectural details, buildings, flowers, landscapes, cathedrals, European monuments, animals, and copies of works by Turner and Tintoretto. 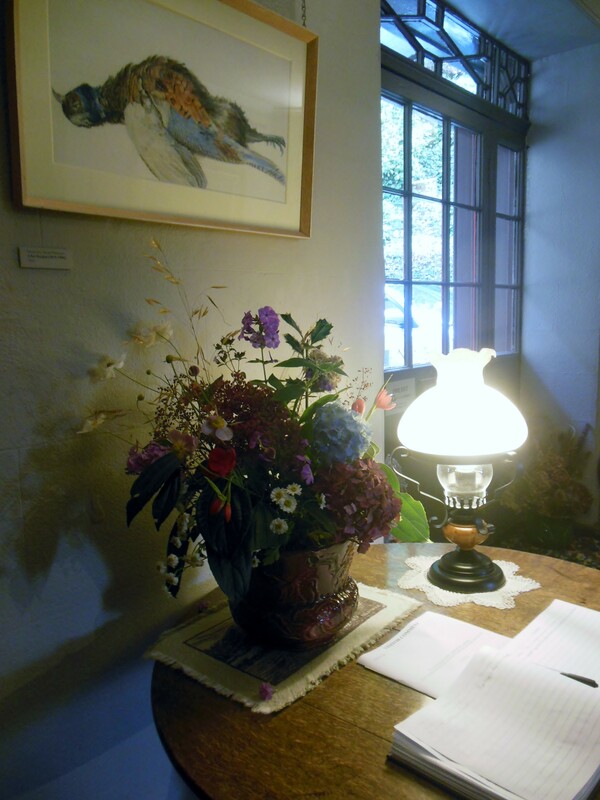 It’s also filled with lovely arrangements of fresh flowers from Brantwood’s gardens. 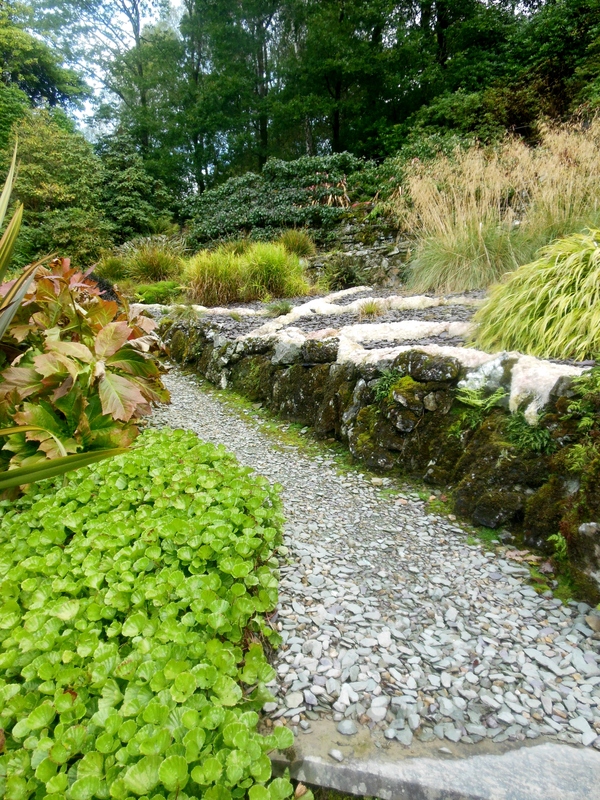 “Brant” is the old Norse wood for steep, which is appropriate for the estate’s eight unique mountainside gardens in which Ruskin experimented with horticulture, land cultivation, and fell drainage. 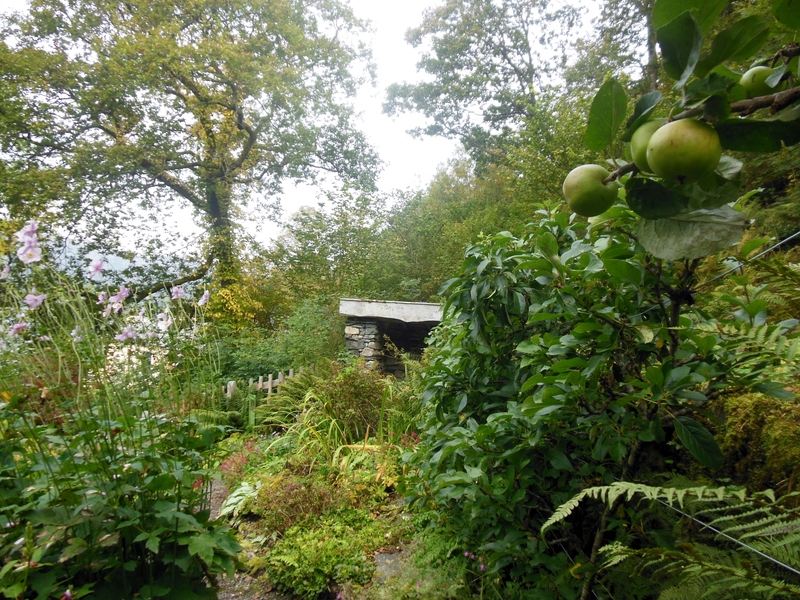 In the cottage garden just above the house, known as the Professor’s Garden, Ruskin experimented with growing flowers, herbs, gooseberry bushes and strawberries. He also built a beehive shelter here. Ruskin was so fascinated by the water flowing from the fells that he built a series of dams and reservoirs to channel it throughout the estate. A small stream drains into a reservoir near the front door of the house; in wet weather, it rushes down the hillside and becomes a waterfall. 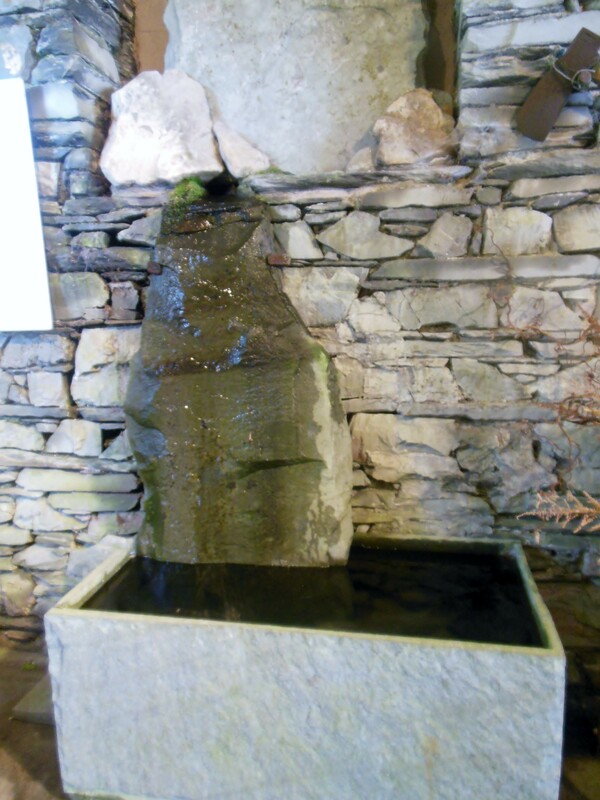 He built a slate seat upon which he could sit and watch the water cascade down the hillside. The estate also features kitchen gardens, walks flanked by azaleas and rhododendrons, an orchard and formal gardens. Nine trellised sections invite visitors to interact with plants. Three of the original six cypress trees that Ruskin brought back from a trip to Italy remain as one of Brantwood’s most recognizable features. Dante’s account in the Divine Comedy of the ascent through Purgatory inspired Ruskin to create the “Zig-Zaggy,” a series of terraced gardens planted in the steep hillside by the car park. To reach Paradise, represented by a flat excavation at the top of the hillside, the visitor has to atone for each of the seven deadly sins, which are represented by plantings in this “Purgatory” garden. Starting at the base of the hillside, enter through a door and walk on steps edged with white (representing innocence), black (sin) and reddish-brown (repentance). Follow a zigzag path up the slope, passing terraced beds planted with bunches of black ornamental grasses. A stony desert with wire and prickly sea holly represent envy. Next comes groupings of dark blue slate chips and grasses bordered with knots made from tufts of matted sheep’s wool, recalling wrath – and the slate quarry across Coniston Water and the sheep grazing in Brantwood’s fields. Inverted espaliers of fruit line the wall, symbolizing temptation and denial. Carpets of more fleece are placed beside a pair of puckered lips, from which leeks and blood grass emerge, representing lust. Near the house, a buildin g which once held Linton’s printing press now features a unique attraction called a lithophone — a type of xylophone made from stones. In Ruskin’s day, musical concerts played on lithophones were popular with Lake District tourists. Lake District slate is famous not only for its durability, but also for its colors, like silvery sea green from Kirkstone, dark blue from Brathay, green from Honister, and black from Coniston. It also rings with a clear note when it is struck. You can play a 21st-century version of Ruskin’s lithophone, made from four different types of Cumbrian slate to create a 49-key, four-octave instrument that Dame Evelyn Glennie played at its 2010 unveiling. There’s also a one-octave iRock instrument, which uses multimedia music technology to show the geological properties of the rocks as they are played. In 1879, Ruskin designed the Jumping Jenny, a boat that could be sailed and rowed equally well. 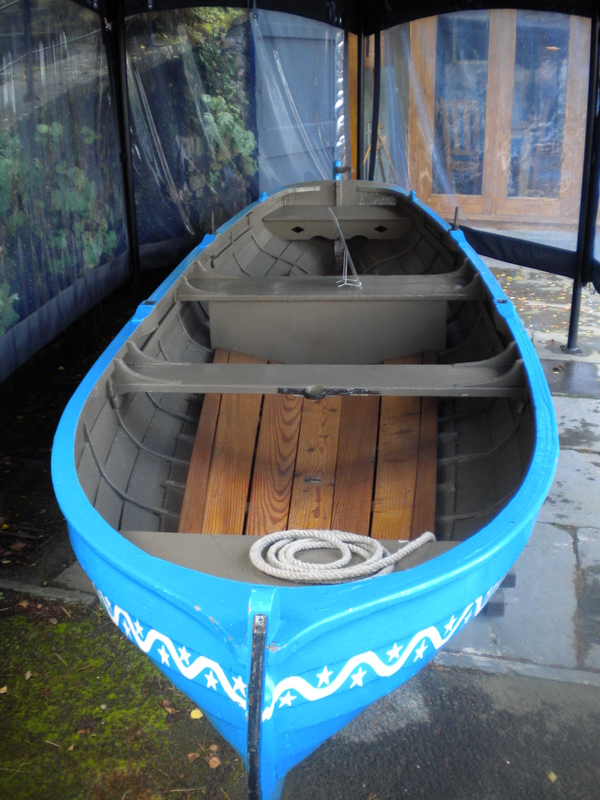 Named after Nanty Ewart’s ship in Sir Walter Scott’s Redgauntlet, the boat was not as successful as Ruskin hoped, but it’s still on view at Brantwood, outside the café. At Brantwood, even shopping becomes a Ruskininan experience. Take home a purchase in a bag carrying Ruskin quotes, such as “All one’s life is a music if one touches the notes rightly and in time.” (The Ethics of the Dust) and “You will never love art well, till you love what she mirrors better.” (The Eagle’s Nest). 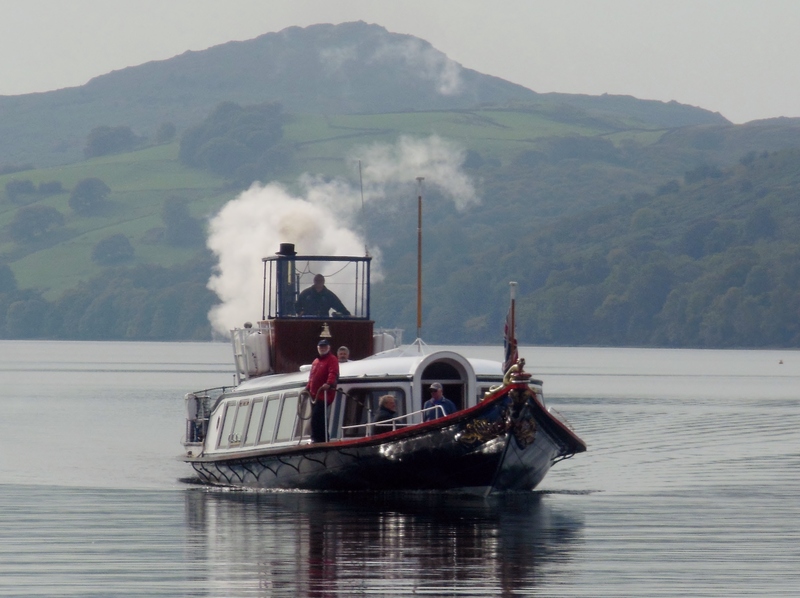 Visitors can arrive and depart from Brantwood’s dock by boat on Coniston Water. I sailed on the Steam Yacht Gondola, which was first launched in 1859, became a houseboat in 1936, and was restored in 1980. Sydney the Sea Serpent is the gondola’s figurehead, symbolic of its connections to the seventh Duke of Devonshire, who commissioned the original gondola when he was chairman of the Furness Railway. The serpent represents the coiled snake emblem on the frieze of the Devonshire home, Chatsworth, and the family’s coat of arms adorns the gondola’s prow. 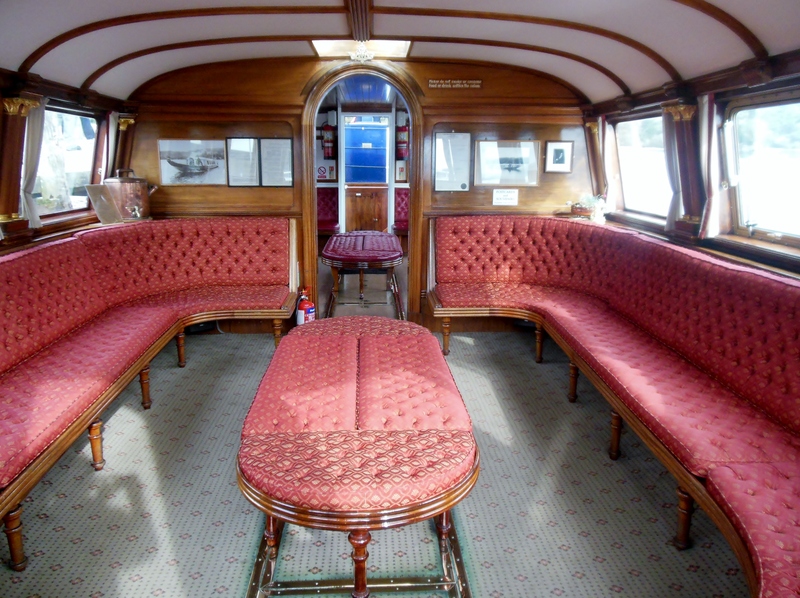 The steam-powered yacht’s opulently upholstered saloon was modeled after Queen Victoria’s private railway carriage. Ruskin had a positive influence on his Lake District neighbors. During a visit to Milan, he made drawings of Cypriot lace to share with women in Coniston, hoping that it might inspire them to try making it. 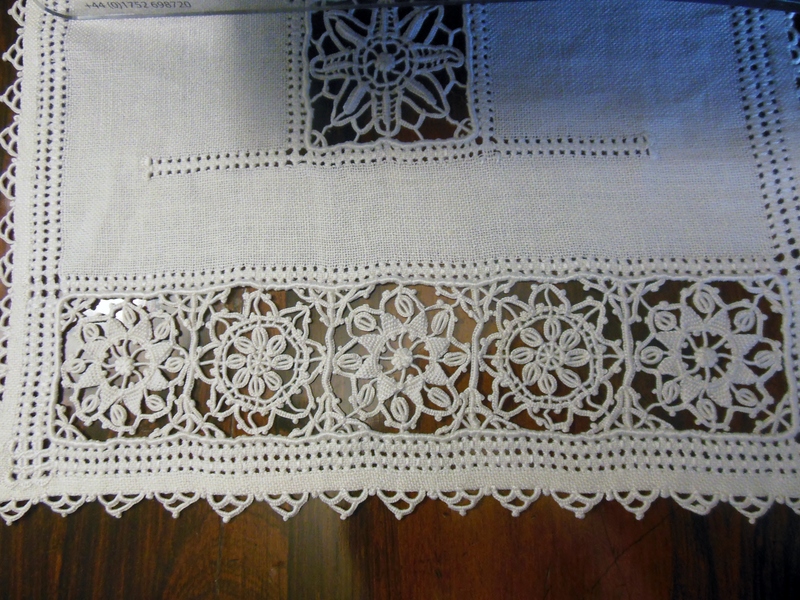 They did, creating a successful local “Ruskin Lace” industry that is still going strong today. He prompted the revival of the linen industry at Langdale and Keswick. Ruskin Pottery was established in his honor in 1898. Hand-thrown forms were finished with mottled single-colored soufflé glazes, luster finishes, and high-fired flambé. After he was appointed a manager of the Coniston village school, he taught botany, encouraged students’ interest in ornithology and astronomy, and taught them to play sets of hand-bells that he donated. He established a woodcarving school in Coniston, where the corner cabinet in Brantwood’s drawing room was made. 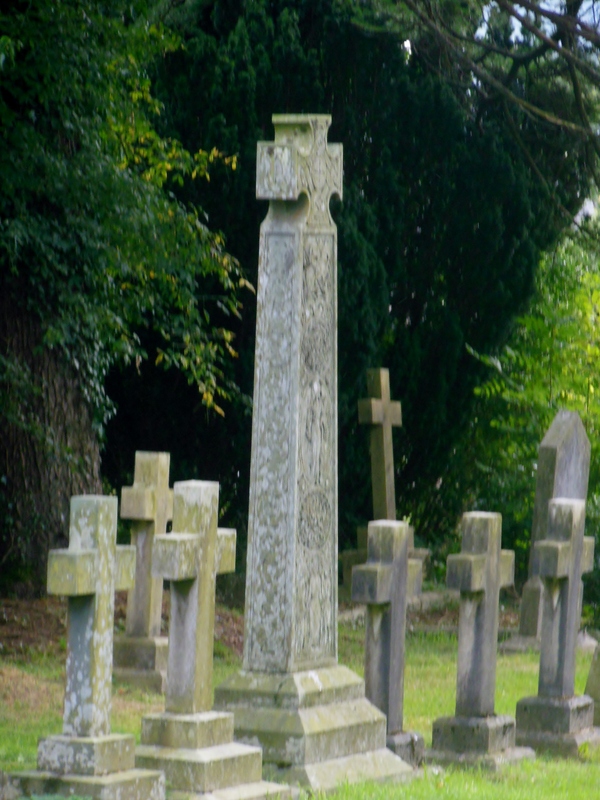 Although he was offered a final resting place in Westminster Abbey, Ruskin chose to be buried in the churchyard at Coniston. After he died in 1900, his gravestone was designed by W.G. Collingwood, who visited Ruskin at Brantwood on an 1873 sketching tour he took of the Lake District with his landscape-painter father. Collingwood settled in the Lake District and became Ruskin’s assist ant, editing his books and publishing books about him. Cut from one piece of local Tilberthwaite stone, Ruskin’s gravestone is adorned with many meaningful symbols. For example, a figure holding a lyre represents Ruskin the young poet. A roundel above Ruskin’s name represents his book, Modern Painters, while the mountain range of Mont Blanc and a sunrise are taken from the binding of early editions of the book. The lion of St. Mark represents The Stones of Venice, and a seven-branched candlestick is for The Seven Lamps of Architecture. For more on John Ruskin and Brantwood, read W.G. Collingwood’s The Life of John Ruskin, an 1893 biography that is still considered one of the best, The Art Teaching of John Ruskin (1891) and Ruskin Relics (1904). Also see Ruskin & Coniston, by James S. Dearden; John Ruskin: Artist and Observer, by Christopher Newall; Ruskin & Brantwood: An Account of the Exhibition Rooms, by J. Howard Whitehouse; Houses of the Lake District, by Christopher Holliday; Gardens of the Lake District, by Tim Longville; Green Victorians: The Simple Life in John Ruskin’s Lake District, by Vicky Albritton and Fredrik Albritton Jonsson; and The Writer’s Garden: How Gardens Inspired Our Best-Loved Authors, by Jackie Bennett. This entry was posted in Art, Books, Gardens, Lake District, Museums, Travel. Bookmark the permalink.